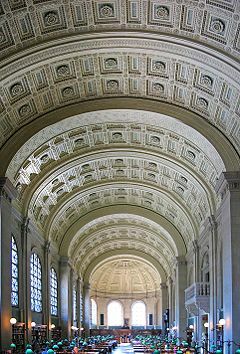 The Boston Public Library is the largest municipal public library in the United States. All adult residents of the Commonwealth of Massachusetts are entitled to borrowing and research privileges. 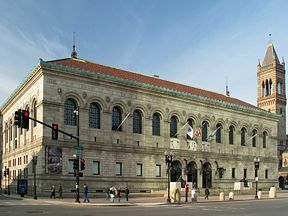 The American Library Association cites the Boston Public Library, with more than 15 million books, the third-largest library in the United States. With public support and the help of significant contributions by numerous individuals, the Library officially opened to the public in 1854. While there had been a number of membership based private libraries prior, the Boston Public Library became the first publicly supported municipal library in the United States. Reading Room in 1871 at the first Boylston Street building, the library's location between 1858-1895. Boston Public Library Main Library Branch as it was on Boylston Street Circa 1886 (demolished 1899). Several people were instrumental in the establishment of the Boston Public Library. George Ticknor, a Harvard professor and trustee of the Boston Athenaeum, raised the possibility of establishing a public library in Boston beginning as early as 1826. At the time, Ticknor couldn’t generate enough interest. In 1841, Alexandre Vattemare, a Frenchman, suggested that all of Boston’s libraries combine themselves into one institution for the benefit of the public. The idea was presented to many Boston libraries, however, most were uninterested in the idea. At Vattemare’s urging, Paris sent gifts of books in 1843 and 1847 to assist in establishing a unified public library. Vattemare made yet another gift of books in 1849. Josiah Quincy, Jr. anonymously donated $5,000 to begin the funding of a new library. Quincy made the donation while he was mayor of Boston. Indirectly, John Jacob Astor also influenced the establishment of a public library in Boston. At the time of his death, Astor bequeathed $400,000 to New York to establish a public library there. Because of the cultural and economic rivalry between Boston and New York, this bequest prompted more discussion of establishing a public library in Boston. In 1848, a statute of the Great and General Court of Massachusetts enabled the creation of the library. The library was officially established in Boston by a city ordinance in 1852. Eager to support the library, Edward Everett collected documents from both houses of Congress, bound them at his own expense, and offered this collection to help establish the new library. At the time of Everett’s donation, George Ticknor became involved in the active planning for the new library. In 1852, financier Joshua Bates gave a gift of $50,000 to establish a library in Boston. After Bates' gift was received, Ticknor made lists of what books to purchase. He traveled extensively to purchase books for the library, visit other libraries, and set up book agencies. To house the collection, a former schoolhouse located on Mason Street was selected as the library's first home. 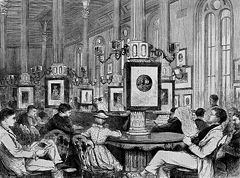 On March 20, 1854, the Reading Room of the Boston Public Library officially opened to the public. The circulation department opened on May 2, 1854. The opening day collection of 16,000 volumes fit in the Mason Street building, but it quickly became obvious that its quarters were inadequate. 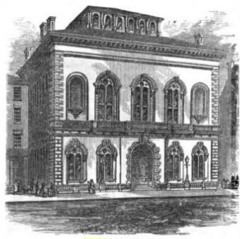 So in December 1854, the library's commissioners authorized the library to move to a new building on Boylston Street. Designed by Charles Kirk Kirby to hold 240,000 volumes, the imposing Italianate edifice opened in 1858. But eventually the library outgrew that building as well; in 1878, an examining committee recommended replacing it with a new one at another location. By 1880, the Massachusetts legislature authorized construction of an even grander library building. A site selected was in Back Bay on Copley Square—the prominent corner of Boylston Street and Dartmouth Street, opposite Richardson's Trinity Church and near the first Boston Museum of Fine Arts. After several years of debate over the selection of the architects and architectural style for the new library, in 1887 the prestigious New York firm of McKim, Mead, and White was chosen to design the new library. In 1888, Charles Follen McKim proposed a design based on Renaissance style which met approval from the trustees of the library, and construction commenced. Courtyard of the McKim building looking north. The campanile of Old South Church can be seen. When it opened in 1895, the new Boston Public Library was proclaimed a "palace for the people." 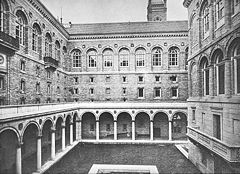 This building included a children's room, the first in the nation, and a sculpture garden in its central courtyard surrounded by an arcaded gallery in the manner of a Renaissance cloister. To Copley Square the library presents a façade reminiscent of Palazzo della Cancelleria, a sixteenth century Italian palace in Rome. The arcaded windows of its façade owe a debt to the side elevations of Alberti's Tempio Malatestiano, Rimini, the first fully Renaissance building. McKim also drew on the Bibliothèque Sainte-Geneviève in Paris (built 1845 to 1851). McKim did not simply imitate his models, however; the three central bays are subtly emphasized without breaking the rhythm. The library also represents one of the first major applications in the United States of thin tile vaults by the Catalan master builder Rafael Guastavino. Seven different types of Guastavino vaulting can be seen in the Boston Public Library. Bates Hall has a coffered ceiling in a wide catena-arched barrel vault. Internet and power connections are discreetly beneath the large wooden research tables. Architect Charles Follen McKim chose to have monumental inscriptions, similar to those found on basilicas and monuments in ancient Rome, in the entablature on each of the main building's three façades. On the south is inscribed: "MDCCCLII • FOUNDED THROUGH THE MUNIFICENCE AND PUBLIC SPIRIT OF CITIZENS"; on the east: "THE PUBLIC LIBRARY OF THE CITY OF BOSTON • BUILT BY THE PEOPLE AND DEDICATED TO THE ADVANCEMENT OF LEARNING • A.D. MDCCCLXXXVIII"; and on the north: "THE COMMONWEALTH REQUIRES THE EDUCATION OF THE PEOPLE AS THE SAFEGUARD OF ORDER AND LIBERTY." The last quotation has been attributed to the library's Board of Trustees. Another inscription, above the keystone of the central entrance, proclaims: "FREE TO ALL." Across the street from the central entrance to the library is a twentieth-century monument to the Lebanese-born poet and philosopher Kahlil Gibran who as a young immigrant educated himself in the Boston Public Library. The monument's inscription responds to the McKim building reading "IT WAS IN MY HEART TO HELP A LITTLE, BECAUSE I WAS HELPED MUCH." The text is excerpted from a letter enclosed with Gibran's generous bequest to the library. Bates Hall is named for the library's first great benefactor, Joshua Bates. Boston Globe writer Sam Allis identified "Bates Hall, the great reading room of the BPL, vast and hushed and illuminated with a profusion of green lampshades like fireflies" as one of Boston's "secular spots that are sacred." The form of Bates Hall, rectilinear but terminated with a hemi-circular apse on each end, is reminiscent of a Roman basilica. A series of robust double coffers in the ceiling provide a sculptural canopy to the room. The east side has a rhythmic series of arched windows with light buffered by wide overhanging hood on the exterior. Heavy deep green silk velvet drapery installed in 1888, and again in the 1920s and 1950s was not recreated in the 1993 restoration of the room. The drapery helped to muffle sound and lower light levels. Designed by Philip Johnson, a late modernist addition (which somewhat anticipated postmodernist architecture) was built in 1967-1971 and opened in 1972. The Johnson building reflects similar proportions, and is built of the same pink granite as the McKim building. Critics have likened it to a mausoleum, citing the small percentage of windows relieving the massive walls in its exterior façade. Since its opening, the Johnson building became the home for the BPL's main circulating collection, which includes works in many languages. It also serves as headquarters for the Boston Public Library's 26 branch libraries. The McKim building houses the BPL's research collection. Dancing Bacchante and Infant Faun, by Frederick William Macmonnies, in the library's Italianate Courtyard. It is one of his most famous sculptures. According to its website, the collection of the Boston Public Library has grown to 7.5 million books, which makes it one of the largest municipal public library systems in the United States. According to the American Library Association, the circulation of the BPL is 15,458,022 which makes it one of the busiest public library systems in the nation. Because of the strength and importance of its research collection, the Boston Public Library is a member of the Association of Research Libraries (ARL), a not-for-profit organization comprising the research libraries of North America. The New York Public Library is the only other public library that is a member of the ARL. It is known as the "library of last recourse" in Massachusetts. All adult residents of the Commonwealth of Massachusetts are entitled to borrowing and research privileges. The library receives state funding. According to the American Library Association, the Boston Public Library, with more than 15 million book volumes, is the third-largest library in the United States after the Library of Congress and the Harvard University library system. Included in the BPL's research collection are more than 1.7 million rare books and manuscripts. It possesses several large and important collections, including first edition folios by William Shakespeare, records of colonial Boston, and the 3,800 volume personal library of John Adams. It has special strengths in art and art history (available on the third floor of the McKim building) and American history (including significant research material), and maintains a depository of governmental documents. There are large collections of prints, works on paper, photographs, and maps, rare books, incunabula, and medieval manuscripts. Murals include: recently restored paintings by John Singer Sargent on the theme of Judaism and Christianity; Edwin Austin Abbey's most famous work, a series of murals which depict the Grail legend; and paintings of the Muses by Pierre Puvis de Chavannes. The library regularly displays its rare works, often in exhibits that will combine works on paper, rare books, and works of art. Several galleries in the third floor of the McKim building are maintained for exhibits. Rooms are also available for lectures and meetings. For all these reasons, the historian David McCullough has described the Boston Public Library as one of the five most important libraries in America, the others being the Library of Congress, the New York Public Library, and the university libraries of Harvard and Yale. Unfortunately, in recent years the Library has not been funded adequately befitting its status. For example, staffing and funding levels for conservation, as of 2006, are below its peers: the BPL's staff of two full-time conservators compares poorly with the New York Public Library's 35. Many colonial records and John Adams manuscripts are brittle, decaying, and in need of attention prompting the library's acting Keeper of Rare Books and Manuscripts to say that "they are falling apart." In the latter half of the nineteenth century, the library worked vigorously to develop and expand its branch library system. Viewed as a means to extend its presence throughout the city, the branch system evolved from an idea in 1867 to a reality in 1870, when the first branch library in the United States was opened in East Boston. The library currently has 27 branches serving diverse populations in the city's neighborhoods. One of the features that the Boston Public Library offered first is free Wi-Fi wireless internet. It is offered throughout the entire library and at all 27 branches, giving access to anyone who has a wireless enabled laptop and a library card to access the Internet. Plug-in Ethernet access is also available in Bates Hall. The Boston Public Library also maintains several Internet databases providing either catalogue or full text access to different parts of its collections, as well as to a number of proprietary databases. Public Internet access is also available to those without laptops, though this is in high demand and will be limited in duration if there are other patrons waiting. ↑ National Register Information System. National Register of Historic Places. National Park Service Retrieved December 14, 2008. ↑ Grace-Ellen McCrann, (2005): "Contemporary Forces That Supported the Founding of the Boston Public Library." Public Libraries 44 (4) (July/August 2005). ↑ Brian MacQuarrie, The Boston Globe, 2006-10-06 lacks means to repair old tomes. Retrieved December 14, 2008. Chapter 78: Section 19C. Regional public library service; annual appropriation, The General Laws of Massachusetts. Retrieved December 14, 2008. Boston Public Library. Boston Public Library, 1848-1998, Our 150th Anniversary. Boston: Boston Public Library, 1998. Boston Public Library. Proceedings at the Dedication of the Building for the Public Library of the City of Boston. January 1, 1858. Boston: City council, 1858. Boston Public Library. Upon the Objects to Be Attained by the Establishment of a Public Library: Report. [Boston]: Trustees of the Public Library of the City of Boston, 1975. MacQuarrie, Brian. "Library lacks means to repair old tomes", The Boston Globe, 2006-10-06. Retrieved December 14, 2008. McCrann, Grace-Ellen. "Contemporary Forces That Supported the Founding of the Boston Public Library." Public Libraries 44 (4) (July/August 2005). Wadlin, Horace G. The Public Library of the City of Boston; A History. Boston, MA: The Trustees, 1911. Whitehill, Walter Muir. Boston Public Library; A Centennial History. Cambridge: Harvard University Press, 1956. All links retrieved June 22, 2016. History of "Boston Public Library"
This page was last modified on 22 June 2016, at 15:17.